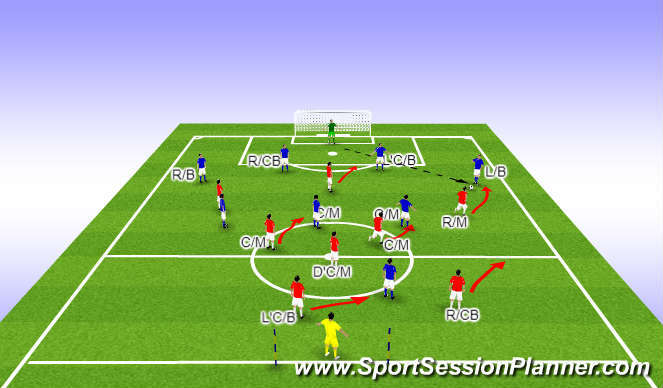 organisation - employ a 3v3 and organise pitch from centre spot to penalty spot plrs positioned as a G/K - C/B - F/B - C/M in the blue team and the reds with a C/F - C/M - R/M. should recover back into &apos;space&apos; so now we&apos;re back where we started but having prevented the oposition to advance up field. working within a three quarter pitch area also bring in a &apos;scoring zone&apos; for blues, for the blues add a R/B &apos;R/CB &apos;C/M and a C/F the target/goal for blues - to work ball into C/F in &apos;scoring zone&apos; , for the reds add a L/M , C/M and a holding C/M. 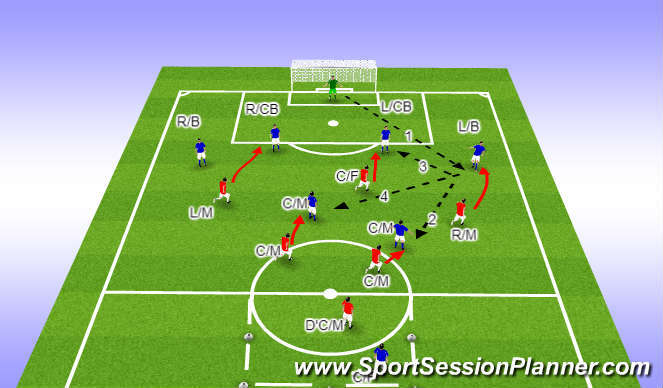 Practice starts with G/K passing to L/B as pass is delivered that&apos;s the &apos;trigger&apos; for R/M to arc run and press L/B into playing ball infield once L/B completes pass the R/M recovers into space&apos; if L/B employes pass 2 on second touch red C/M will press on outside shoulder (C/M &apos;trigger&apos; is R/M movement) mindset "can I pinch the ball or do I press and force back" C/F should &apos;hold position to prevent pass to 2nd C/M(pass 4) or transfering play to left side of pitch also can s/he press from the front but if L/B decides to employ pass 3 reds C/F presses the L/CB on inside &apos;mindset stop pass from L/CB to R/CB the &apos;trigger for C/F is L/B body position/shape in readiness to pass into L/CB , the red L/M should take up a position half distance between C/M and R/CB (blues) and in line with edge of 18yrd box in readiness to press C/M from the front and also provide balance and the other red C/M will press the second blue C/M on the outside shoulder with a mindset of &apos;can I pinch it&apos; or press play back &apos;the reds D/CM is to cover if either C/M loose or force oponent inside/advance forward s/he can engage also the D/CM will stop/intercept pass into blue C/F. MIRROR IMAGE OCCURS IF PLAY IS ON LEFT SIDE. now employ a 9v9 practice in a small-sided game using a three quarter pitch&apos; introduce a &apos;goal&apos; for blues&apos; bring in a G/K for the reds and two C/Bs -20mins. 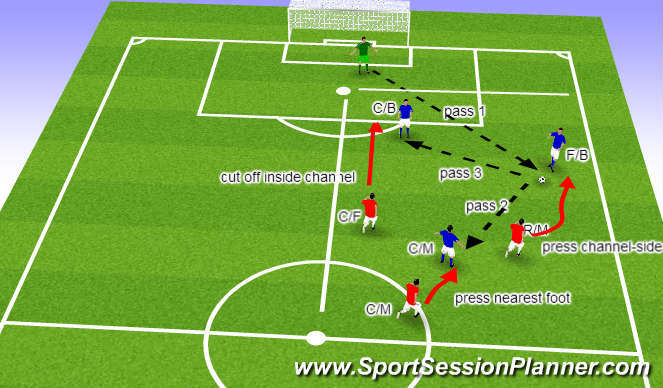 practice starts with G/K serving/passing into either F/Bs to start with&apos; all key points and principles of function/phase must be re-enforced throughout, goal for blues now is as in regular game also the same for reds. a - Reds must have effort on goal within six passes if they fail practice restarts with blue G/K, to allow coach to observe topic being employed by red team. b - Tempo of practice i.e does G/K start at &apos;game pace&apos;. c - Distances and angles employed by plrs. d - Plrs following specific tasks/responsabilities of topic. e - All technical aspects followed i.e how do plrs approach opponent.